Sophie Barthes (COLD SOULS) retelling of Flaubert’s iconic novel Madame Bovary is faithful to the period and the plot and mostly well executed if undermined by some rather quirky casting, pronunciation and accent choices. Set in nineteenth century provincial France the novel tells the tail of a naive convent-educated girl married young to the country doctor, Monsieur Bovary, in a era when country doctors were hardly at the forefront of science and small villages were rather deadening places full of superficial propriety and repeated conversations. Young Emma is a Romantic and fatally so - open to anyone and anything that she believes will give her an escape from her dull life. This may be lovers - from the callow young legal clerk to the dashing Marquis - or in a move that was absolutely modern at the time - consumerism. For Emma falls into the hands of the flattering local shopkeeper who is all to willing to extend her credit to fill her house with beautiful furnishings and her wardrobe with beautiful clothes. Emma must, I suppose, be innocent at first of the debts she is taking on but both novel and film become far more interesting and tragic when we see her understanding, desperation and sense of betrayal. As I said, Barthes' new film is faithful to period and location. The costumes are stunning, as is Andrej Parekh’s gorgeous photography of Rouen and its neighbouring villages. One feels the damp gloom or provincial life - the drizzle, mud and limited options soak through to the bone. As expected, Mia Wasikowska is utterly convincing as Emma and suitably young - sometimes I feel the role is cast too old. We don’t believe she’s a bad woman - just a misguided and self-delusional one. I also thought Henry Lloyd-Hughes and Logan Marshal-Green as her husband and the Marquis were absolutely spot on in their characterisations. Indeed the only casting mis-step is that of Ezra Miller as the young legal clerk. He doesn’t seem able to modify his gait or annunciation to fit the period and brought me right out of the film. That said, the way in which the language is handled is altogether problematic. We have Rhys Ifans as Monsieur Lheureux doing a thick French accent. We have Mia Wasikowska and Ezra Miller in American accents. Lloyd-Hughes and Marshal Green are doing English accents. And none of them, except perhaps Lloyd-Hughes as Charles Bovary seem naturalistic in how they speak. Contrast this with the way in which Mike Leigh makes the antiquated language come alive and seem utterly natural in MR TURNER. Otherwise, the fault of this film is its lack of ambition but I suppose one can hardly criticise it for what it is not. We live today with the consequences of a massive consumer-driven debt crisis - where aspirational shopping on credit is abetted by reality TV shows that show shopping as a virtue. 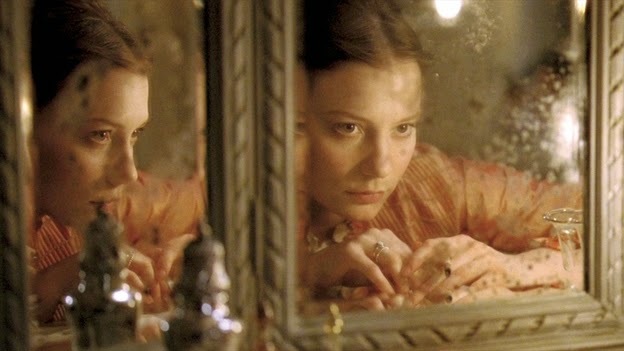 Wouldn’t it have been fun to transpose Madame Bovary to the modern age and see the results? MADAME BOVARY played Toronto and London 2014. It does not yet have a commercial release date.